For awhile now I've been collecting green pieces of fabric - any pattern, any shade - in hopes of making an all green quilt. I've even asked friends to help me in my quest to gather green fabric anywhere they go - just pick up a piece of something that is fun and I'll incorporate it into my quilt! After gathering all this green I had a vision in mind of all cream triangles on one side and all the greens on the other. Then I threw all the greens in a big pile and had second thoughts - how could this all possibly go together?!?! 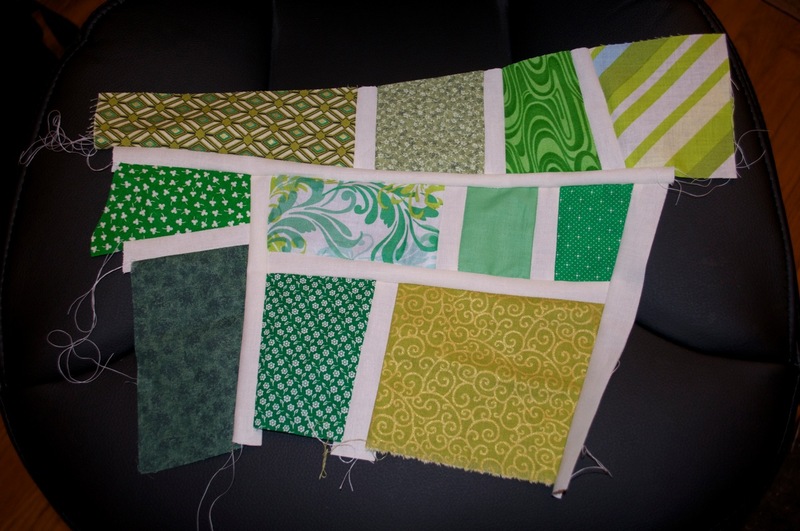 So, back to the drawing board - now I made the greens into little groupings - olive greens, bright greens, pine greens, etc and I was going to just pick from a grouping and make the triangle quilt, BUT not enough greens were in each group! Grrrr!!! So in frustration I put the green away in a stack in the corner for months and just stared at it while I completed other projects hoping that something would inspire me to want to use the green again. Circles, waves, log cabins, and all sorts of other ideas zoomed around my head and were quickly kicked out for one reason or another. Then I came across this lovely Mosaic Pattern from Oh Fransson! (author of the Tokyo quilt) in blue and thought, "YES! I will do this in my GREENS!" So, last night I got back out all the greens and got started. 5...4...3...2...1 - HAPPY NEW YEAR!